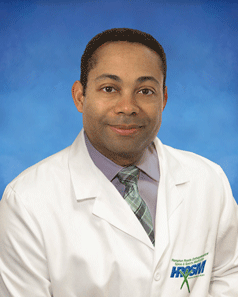 Dr. Alexander Lambert, specializes in sports medicine, and has been in private practice since 2002. He considers the best part of his job having the ability to treat patients and to be blessed with the skills to take care of his patients. Besides serving his country, Dr. Lambert has also served has a team physician for the College of William and Mary since 2002 and was a team physician for CNU from 2002-2006. Dr. Lambert’s practice focuses on Sports Medicine, Knee And Shoulder Ligament Reconstructions and General Orthopaedics. Dr. Lambert earned his medical degree in 1988 at Howard University College of Medicine in Washington, DC, after graduating from the United States Military Academy at West Point, NY, in 1984. He performed his residency at Brooke Army Medical Center at Fort Sam Houston, TX, and his internship at William Beaumont Army Medical Center in EL Paso, TX. Dr. Lambert served in the U.S. Army from 1988-2002. In 2001-2002 he served in Bosnia. He also served on the Orthopaedic Surgery Service staff at Fitzsimons Army Medical Center and as Chief of Orthopaedic Surgery/Podiatry Service at McDonald Army Community Hospital. He was Team Physician for the All Army Soccer Team and Armed Forces Soccer team. Dr. Lambert was Chief of the Aviation Medicine Clinic at William Beaumont Army Medical Center and served in Operation Desert Shield and Operation Desert Storm as Squadron Surgeon/Medical Platoon Leader. Dr. Lambert is a member of the American Academy of Orthopaedic Surgeons, Society of Military Orthopaedic Surgeons, American Medical Association, Medical Society of Virginia, and Virginia Orthopaedic Society. He is certified by the American Board of Orthopaedic Surgeons, Inc.